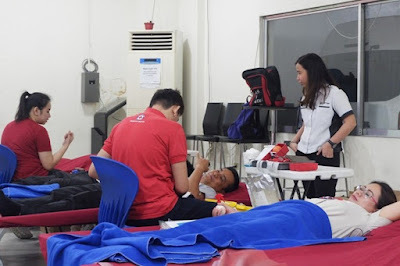 In support to the Philippine Red Cross and to promote health awareness to its employees, United Asia Automotive Group, Inc. (UAAGI), the exclusive distributor of Foton vehicles in the country, facilitated a bloodletting activity in its offices in Quezon City and Valenzuela last August. For more than 5 years, Foton has been strengthening its collaboration with the Philippine Red Cross (PRC), the premier humanitarian organization in the country in providing health services. “We facilitate blood donations primarily for Foton’s employees so when they or their families need it, the company could take part in donating which is a vital medical stipulation.” said Foton Philippines Executive Vice President Anna Maria Parado. Through this project, Foton remains committed to give charitable service as volunteer employees donated bags of blood which were turned over to the Philippine Red Cross – Quezon City chapter. Consequently, because of the brimming support shown by Foton’s volunteers, Parado asserted that their beneficiaries has been made not limited to Foton’s employees and families as they have extend their blood donations externally. 41 employees of UAAGI braved the needles, enabling PRC to collect a total of 13,950-cc of blood. “With pride, I must say that the Foton team is unified to reinforce a healthier lifestyle and most importantly, hope to our brothers and sisters in need.” Parado added. Last April, Foton Philippines has also shown their support to the Philippine Red Cross by donating a brand new unit of TransVan HR Ambulance.